Using the calculation tool SCFW, the solar net gain of a solar thermal plant integrated in a district heating network can be calculated. The calculation follows strictly the formulas of ScenoCalc and DIN EN ISO 9806 on the one hand and considers relevant decreasing effects of the whole system on the other hand. These effects contain heat capacity of collectors, heat losses of pipes, fittings and optional storage, antifreeze protection, and heat exchanger. In case of heat exchangers the increasing collector average temperature is more relevant than heat losses. These futher calculations enable to calculate the solar net gain at the point where it is fed into the district heating network. The weather data and the load profile of the district heating network is taken into account in the hourly calculation. SCFW is implemented in an Excel-Workbook and calculates formulas according to the values the user chooses. There is no check of the values and the user should have knowledge of the solar thermal system. The results of SCFW are first estimations and no complete system design. 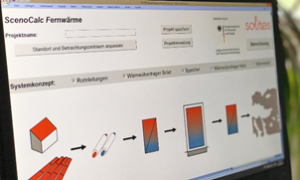 The project developes an open-source, freely available calculation program in Excel, which can be used to calculate the solar net gain of solar thermal systems in district heating nets and to compare different systems. To ensure broad acceptance of the calculation program, it is based on the by international standards (Solar Keymark) defined and widespread simple calculation program ScenoCalc. On the mathematicalprinciples of J .A. Duffie and W. A. 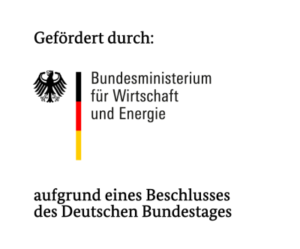 ​​Beckman, European scientists (e. g. Bengt Perers, Peter Kovacs) developed an open Excel program that is approved by all institutions for energy yield forecast in the certification of collectors according to the Solar Keymark process. This “ScenoCalc” program is limited to the consideration of a single collector, so that a whole solar systems can not be calculated. However, it is ideally suited as the basis for almost every type of solar thermal collector. The research project aims to develop a simulation tool holding one hand with regard to the panels strictly to the algorithms of ScenoCalc, but then consider possible, all known relevant effects on the energy yield. If these effects are all “turned off”, then the simulation tool shall provide exactly the same collector yield data as with ScenoCalc. Simple calculation program for yield forecasts for solar thermal systems in district heating networks as a for experts open Excel tool. SCFW was published in June 2017 and is available online on www.scfw.de in German language. SCFW develops an Excel tool based on ScenoCalc for calculation of the solar net gain of solar thermal systems that are integrated into district heating networks.